The venture of adopting a new creed for the university was led by Patricia MacKown from the Office of Student Rights and Responsibilities in the Division of Student Development and Enrollment Services. Since its inception in 2001, the UCF Creed has been incorporated into various aspects of university life, including housing, orientation, Student Government Association and in the classroom. SDES is committed to “adding values” to the student experience by intentionally, deliberately and creatively aligning our work with the UCF Creed. The values of Integrity, Scholarship, Community, Creativity, and Excellence guide our actions, decisions and behaviors. They are the core tenets that SDES embraces in our efforts to advance and demonstrate student learning and student success in all that we do. We continue to believe that the student who graduates from UCF is not the same student that starts at UCF. Our division is committed to uphold the core values of integrity, scholarship, community, creativity and excellence that are expressed in The UCF Creed. We are dedicated to establishing partnerships within the university community and promoting diversity and inclusiveness in all we do. 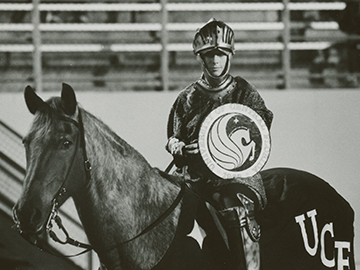 Following one year of research and brainstorming by a task force appointed by President John C. Hitt, The UCF Creed was introduced to approximately 1,500 UCF students and their families at the New Student Convocation on August 2001. This began a new UCF tradition. From a statistical standpoint, past creeds and honor codes at various universities have shown on average a ten percent decrease in regards to students cheating on exams. The venture of adopting a new creed for the university was led by Patricia MacKown, Student Development and Enrollment Services, guiding the efforts of Ryan Mallory, a UCF student. Mallory was participating in a LEAD Scholars assistantship, and researched other universities, colleges and military institutes’ creeds and honor codes. His research included the University of Virginia and the University of South Carolina, looking at traditional honor codes and modified versions from across the country. Following that research, a focus group / task force of students was formed to review ‘trial creeds,’ in the hopes that their collaborative efforts would find the perfect solution for UCF. The reason for UCF developing a creed was to adopt a value system for the students, faculty and staff to share, making it just as important that they practice honesty, integrity and respect, not only for themselves but for others as well. The creed was also put in place to discourage behavior that threaten the freedom and respect for all members of UCF.